The Summary block shows the total number of managed backup servers, performed jobs, processed machines and virtual machine templates. The Data block shows the average processing speed, total sizes of processed machines, full backups and increments. The Last 24 hours/Last 7 days block shows the total number of job runs, successful jobs, jobs with warnings and failed jobs. You can use the links in these blocks to drill down into detailed reports on specific aspects of the backup infrastructure. 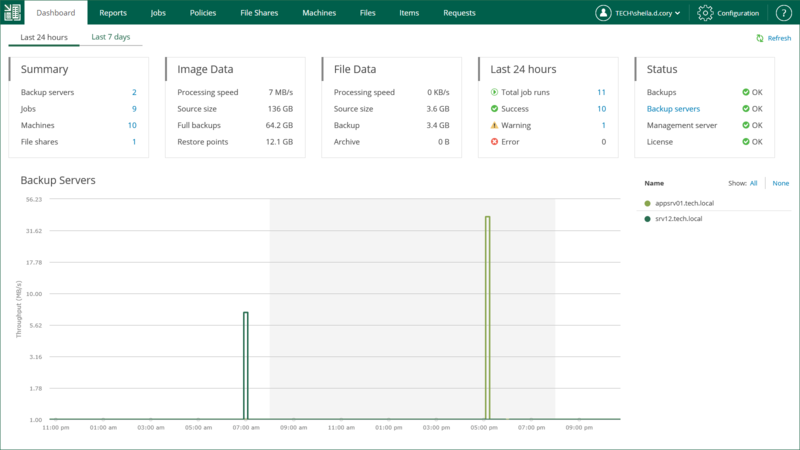 To visualize on-going backup jobs data, Veeam Backup Enterprise Manager uses graphs showing time and date when backup jobs were performed, and the network throughput rate during backup jobs. Jobs related to one backup server have separate colors on the graph. The legend on the right interprets the color scheme used for all managed backup servers. The highlighted part of the graph represents the configured backup window. You can configure the backup window in the dashboard settings. For more information, see Customizing Dashboard Appearance. 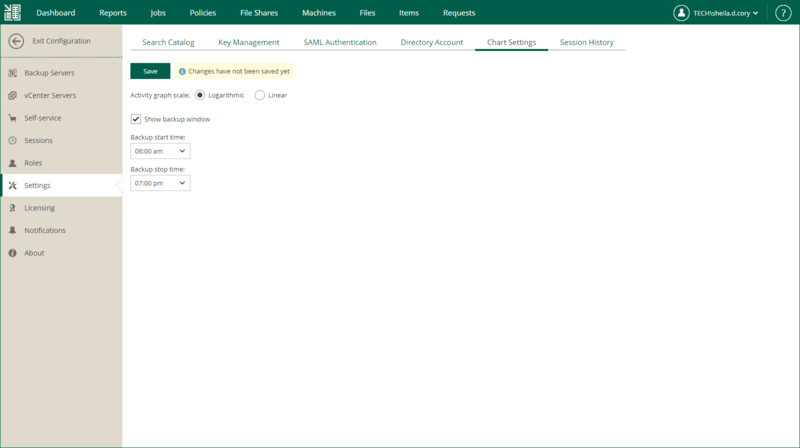 Click the Settings section on the left of the Configuration view. Use the Activity graph scale options on the Chart Settings tab to switch between graph types: Linear and Logarithmic. By default, the time interval specified under the selected Show backup window check box is highlighted on the activity graph. Default interval is from 8:00 PM to 8:00 AM. You can change the highlighted interval to correlate with your planned backup window by editing the start and stop time. If you do not want to highlight the backup window on the graph, clear the Show backup window check box.